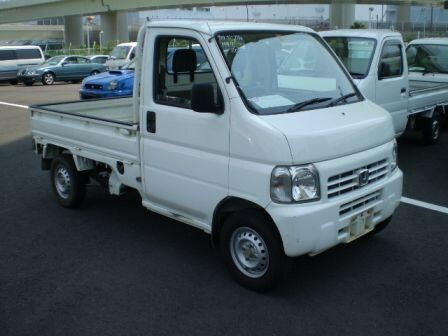 Honda Japanese Mini Trucks - The most versatile utility vehicles around! Honda specific specifications: Honda is All Wheel Drive which means that it is not switch able between 2wd and 4wd so that you do not have to mess with 4wd controls and concentrate on driving. General Specifications: Liquid cooled, 660cc, 3 cylinder engines with low miles, 4X4, 4 or 5 speed manual with high/low transfer case. 4'x6' box has fold down and removable sides and tailgate to make a flatbed. Radio, windshield wipers, seat belts, standard lights and full instrumentation. The Mini Truck Advantage: Cab, heat, 4x4 standard compare that with other utility vehicles! Optional AC, Dump box & power steering!